In a number of cultures in various parts of the world, bridal gowns occupy a significant part of the overall wedding spending. The marked significance of bridal gowns among brides for a getting a harmonious and magnificent look on the wedding day is a key factor catalyzing the growth of the global market. In recent years, the market has seen the advent of bridal gowns with a variety of fabrics, designs, styles, and workmanship, which has helped brides to meet their needs of an unforgettable bridal outfit. The advent of low-priced wedding gowns for cash-strapped brides is a key factor boosting the market. The rising prominence of mass marketization of bridal gowns and a large number of retailers entering the online arena of the wedding industry are prominent developments expected to greatly influence the market dynamics in coming years. Furthermore, several players focusing on designing elegant yet affordable bridal gowns is a key factor expected to unlock exciting opportunities in the coming years. The bridal gowns market is estimated to be valued at US$32,454.2 Mn by 2017 end and is forecast to reach a worth US$43,502.8 by the end of 2022. The market is anticipated to register a CAGR of 6.0% during 2017–2022. The major regional markets profiled in the report are North America, Latin America, Middle East and Africa, Europe, Asia Pacific excluding Japan (APEJ), and Japan. Of these, the APEJ market is the leading regional market holding the major revenue in 2017. The regional market is projected to maintain its dominance over the forecast period as well. Expanding at a CAGR of 6.4% from 2017 to 2022, the regional market is expected to reach a valuation of US$13,529.3 Mn by the end of the forecast period. The attractiveness of this regional market is largely attributed to burgeoning spending in wedding gowns in several developing economies. In addition, the growing demand for plus-size bridal wear and the rise in online sales of bridal outfits are key factors expected to accentuate the regional market. North America is one of the prominent markets for bridal gowns and is projected to rise at a significant CAGR of 7.1% from 2017 to 2022. The regional market is anticipated to rise from US$ 7,948.7 Mn in 2017 to US$11,192.2 Mn by 2022 end. The growth of this regional market is likely to be fueled by constant innovations in fabrics, designs, and styles of bridal gowns. The growing popularity of designer bridal dresses is expected to accentuate the regional market. The major styles of bridal gowns are ball gowns, mermaid-style dresses, trumpet dresses, A-line dresses, sheath wedding dresses, and tea-length wedding dresses. Of these, the ball gowns style segment leads as it holds the major revenue in the market in 2017 and is expected to witness major absolute growth annually from 2017 to 2022. The estimated valuation of the ball gown segment is US$ 8,595.0 Mn by 2017 end, representing a share of 26.5%. The segment is projected to reach a worth of US$ 11,416.2 Mn by 2022 end holding a share of 26.2% in the market. This will represent a CAGR of 5.8% during the forecast timeline. Annually, the segment is growing at US$ 564.2 Mn over the course of the forecast period. The substantial demand for these styles is attributed to their flexibility to fit all body shapes and sizes among brides. Considered as classic bridal outfit, this style has well-adjusted to address the dynamically changing wedding fashion market in recent years. Leading players profiled in the report include Kleinfeld Bridal Corp., David’s Bridal, Inc., Elie Saab France, Harrods Limited, JLM Couture, Inc., Justin Alexander, Inc., Maggie Sottero Designs L.L.C., and Moonlight Bridal Design, Inc. Numerous prominent players are launching innovative product lines having magnificent look and are focusing on affordability of their products, in order to gain a competitive edge over others. The new report on the global bridal gowns market offers a comprehensive outline of key market dynamics during the forecast period (2017–2022). The research incorporates a detailed historic overview of the share and size of various segments during 2012–2017 and analyzes various trends boosting the demand of prominent segments. In addition, the report offers revenue share of major regions and provides an evaluation of important developments influencing these regional markets. Furthermore, the study analyzes their role in generating revenue during the forecast timeline. This helps market participants get a reliable idea of the growth of these markets. In addition, the study takes a closer look at recent product innovations and offers an extensive profile of market players. The bridal gowns market is estimated to rise from US$32,454.2 Mn in 2017 to a valuation of US$43,502.8 by 2022 end. The worldwide market is projected to rise at a CAGR of 6.0% during the forecast period. The study provides detailed insights into key drivers and trends, restraining factors, notable opportunities, competitive dynamics, and lucrative avenues in various regions. The analysis offers an insightful opinion on key factors driving the popularity of some styles of bridal gowns over others. The rising demand for various styles of bridal outfits as a part of lavish and wedding is a key factor boosting the market. The advent of new, innovative bridal lines from various retailers, which can be tailored to suit the varied body sizes of brides is accentuating the market. The rising affordability of exotic styles of bridal gowns in various regions is providing a robust impetus to the market. The continuous launch of exotic designs with amazing workmanship is boosting the market. The rising disposal incomes of middle-class populations in various emerging economies has stimulated them to splurge in wedding gowns. The advent of e-commerce and the mass marketization of bridal outfits in developed countries are key factors reflecting negatively on the market. Nevertheless, the adoption of new fashion trends in bridal wear in developed and developing regions is a key factor expected to open up exciting avenues for market players. The report covers the share of various segments and offers a comparative analysis of the revenue across various regions. The research also provides an in-depth insight into year-on-year comparison of the market sizing in these regions. On the basis of style, the bridal gowns market is segmented into ball gowns, mermaid-style dresses, trumpet dresses, A-line dresses, sheath wedding dresses, tea-length wedding dresses, and others. Of these, the segment of ball gown holds the major share in the market and is expected to rise at an absolute growth of US$ 564.2 Mn, annually, which is larger than any other style segment. The dominance of this style is largely attributed to its sophistication and its ability to be a versatile fit for brides of all body shapes and sizes. 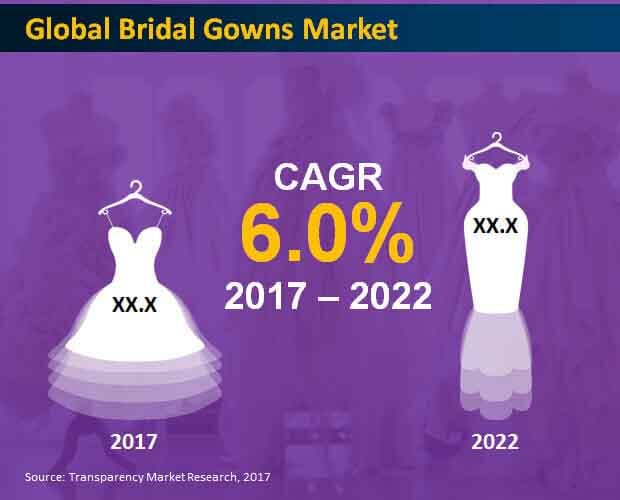 On the basis of sales channel, the report segments the global bridal gowns market into modern trade, franchise outlets, women's clothing stores, boutiques, bridal stores, and e-commerce. Based on geography, this report segments the worldwide bridal gowns market into North America, Latin America, Middle East and Africa, Europe, Asia Pacific excluding Japan (APEJ), and Japan. Among these, APEJ holds the leading share, vis-à-vis revenue and is expected to retain its dominance throughout the forecast period. The regional market is projected to rise at 6.4% CAGR from 2017 to 2022. A lavish spending on wedding in various cultures is a key factor expected to fuel the regional market. The report offers a detailed profiling of various retailers and their offerings. It further evaluates the strategies adopted by them to consolidate their presence in various regions. Some of the prominent players operating in the market are Kleinfeld Bridal Corp., David’s Bridal, Inc., Elie Saab France, Harrods Limited, JLM Couture, Inc., Justin Alexander, Inc., Maggie Sottero Designs L.L.C., and Moonlight Bridal Design, Inc.